In this file photo, a rescue team of the Spanish NGO Proactiva Open Arms transfers refugees and migrants, from different African countries, from the overcrowded rubber boats on which they had left Libya to an Italian Military Ship, about 20 miles North of Sabratha, Libya, Saturday, March 4, 2017. Nineteen people drowned when a boat loaded with as many as 150 people who were thought to be migrants capsized off the northern coast of Cyprus, a Turkish Cypriot official said Wednesday. The Turkish coast guard said it rescued 103 of the capsized vessel's passengers and took them to Turkey. One seriously injured person was being treated at a hospital in the northern part of Cyprus' capital, Nicosia, Atakan said. Atakan said the nationalities of the passengers have not been confirmed. When asked if they were thought to be migrants, Atakan said "most probably." Aysegul Baybars, the interior minister in northern Cyprus, told Turkey's CNN-Turk television that authorities were investigating if bad weather, sabotage or other factors caused the sinking. She said authorities don't know where the vessel has set sail from or where it was heading. The capsizing occurred around 16 miles (26 kilometers) north of Cyprus' Karpas Peninsula, but it's not yet clear when. In May, nine Syrian migrants drowned when their boat capsized off Cyprus' northern coast. The United Nations' refugee agency said it was the first shipwreck involving migrants off the island nation. Friction between the Italian government and private aid groups that patrol the sea to look for people in danger ratcheted up Wednesday when a Spanish aid organization shunned an Italian port for one in Spain. Proactiva Open Arms said it found a survivor and two dead bodies from a migrant boat wreck on Tuesday=and accused Italy of complicity. The aid organization accused Libya's coast guard, which has received training from Italy and funding from the European Union, of abandoning the three people Monday when it took 158 other migrants from the boat and destroyed it. In a statement on Wednesday, the aid group said it did not trust how the Italian government would handle the investigation of Monday wreckage after Interior Minister Matteo Salvini referred to the group's account as "lies and insults." The strongman in the new Italian populist government, Salvini has vowed to halt the flow of migrants across the Mediterranean, giving aid to Libyan authorities and vowing to close the country's ports to aid groups it accuses of helping human traffickers by picking up migrants and bringing them to Europe. 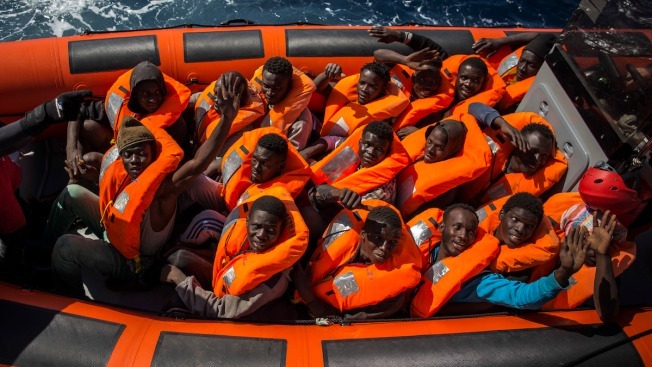 Libya's coast guard denied on Tuesday having left anyone at sea and blamed any deaths at sea on human traffickers and the "presence of such irresponsible, non-governmental groups in the region." In addition to accusing Libyan coast guards, Proactiva's director Oscar Camps said Italy was to blame for "enlisting assassins" to "kill and torture" those who try to cross the Mediterranean. "The policies of Matteo Salvini are responsible for this crime," Camps said in a statement. "Could it be that they have something to hide?" he asked.